AVR-S910 is rated 2.7 out of 5 by 6. Discover a thrilling new dimension in home theater surround sound with the AVR-S910W 7.2 channel A/V receiver which features Dolby Atmos immersive surround sound decoding, delivering breathtaking surround sound with today's advanced movie soundtracks. With Dolby Atmos, you'll experience the same revolutionary 3D surround sound found in premium movie theaters, with the ability to create an overhead surround soundfield that dramatically expands the sonic space. And, via a future firmware update, the AVR-S910W will be able to decode DTS:X soundtracks, which also deliver an immersive 3-dimensional soundspace. Prepared for the future, the AVR-S910W features an advanced video processing and signal handling system, including the latest HDMI 2.0a specification which provides for 4K Ultra HD full rate 60 Hz content, 4:4:4 Pure Color sub-sampling and 21:9 aspect ratio pass-through. It's also HDCP 2.2 compliant, which is a requirement for 4K Ultra HD copy-protected content. Full wireless connectivity is provided by both Wi-Fi and Bluetooth, with dual antennas that deliver robust signal transmission and reception. Stream your favorite audio tracks wirelessly to the AVR-S910W, and enjoy easy control via our available iOS, Android and Kindle apps. For decades, movie surround soundtracks have been channel-based. Dolby's revolutionary Atmos surround sound technology dispenses with channel-based coding in favor of more advanced object-based coding, giving the sound designer the ability to precisely place sounds anywhere in the 3-dimensional space. Now, you can enjoy this same award-winning technology at home with the AVR-S910W, which features the ability to connect a 5.1 surround sound speaker system and 2 additional overhead speakers or 2 additional Dolby Atmos-certified up-firing speakers for the ultimate home theater experience. Along with Dolby Atmos decoding, the AVR-S910W also features Dolby TrueHD lossless decoding and other Dolby Digital technologies. The latest immersive surround sound system, DTS:X features object-based audio coding that lets the sound designer place sonic elements anywhere in the 3D acoustic soundspace, and provides for overhead speakers to deliver a stunning surround sound experience. Along with DTS:X decoding, the AVR-S910W features DTS-HD Master Audio decoding and other DTS audio technologies. DTS:X will be enabled through a future online firmware update. For more info, please visit www.denon.com/dtsx. Featuring an advanced quad-core 32-bit DSP processor, the AVR-S910W easily handles multi-thread processing tasks, including Dolby Atmos and DTS:X decoding, Audyssey room acoustic correction, bass management and DSP surround simulation. The processor features tremendous processing power, with 4 300-MHz DSP cores that deliver over 1 billion computations per second. Featuring 8 HDMI inputs, including 1 conveniently located on the front panel, along with dual HDMI outputs, the AVR-S910W incorporates an advanced video section that features the latest HDMI 2.0a specifications, including support for 4K Ultra HD 60 Hz full rate video, 4:4:4 Pure Color sub-sampling and 21:9 video pass-through, along with support for 3D content. The AVR-S910W also features HDCP 2.2 compatibility, a requirement for 4K Ultra HD copy-protected content. Featuring Bluetooth & Wi-Fi wireless streaming connectivity, the AVR-S910W is equipped with an advanced dual antenna RF transceiver system, for robust and error-free streaming even in congested urban environments. Connect to the internet through your home Wi-Fi network (or with a hard-wired connection via the RJ-45 Ethernet LAN port) and enjoy your favorite tracks from streaming music services such as Pandora, Spotify Connect and Sirius XM. You can also choose from thousands of internet radio stations around the world, and enjoy music from virtually every genre. With AirPlay, you can enjoy listing to your favorite tracks wirelessly from your favorite iOS device, including the iPod touch, iPhone and iPad, and the AVR-S910W is also DLNA 1.5 certified for compatibility with your home PC or Mac. 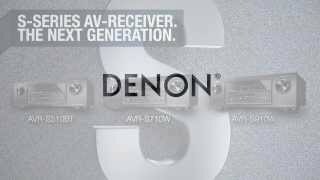 Our Denon Remote App lets you easily control the AVR-S910W with your favorite portable device, and is available for Apple and Android devices as well as the Kindle Fire. In addition to handling 4K Ultra HD 3840x2160 resolution, the AVR-S910W also features HDR (High Dynamic Range) and Wide Color Gamut compatibility, key components of the BT.2020 4K Ultra HD video specification. The advanced video processing section features the ability to upscale SD and HD content to 4K Ultra HD. And, the AVR-S910W also features analog video to HDMI upconversion along with 2 analog component video inputs for full compatibility with legacy SD and HD source devices that don't have HDMI outputs, letting you run just 1 HDMI cable to your TV. Featuring high current discrete power output devices, the AVR-S910W delivers high power and is rated at a maximum of 185 watts per channel. There's also an Auto Eco mode that adjusts the maximum power available according to the volume level, as well as an on-screen Eco meter that lets you see the power consumption reduction in real time. For compatibility with the widest range of loudspeaker models, the AVR-S910W is also equipped with low impedance drive capability, to provide operational stability with speakers rated at 4 ohms. The AVR-S910W features dual subwoofer outputs, which lets you connect two smaller subwoofers instead of a single, larger sub, and enjoy the benefits of response averaging by having two subs in different locations in the room. With dual subwoofers, deep bass is smoother and more detailed, minimizing the peaks and dips that often result with a single subwoofer setup. Denon was the first A/V manufacturer to embrace Audyssey's advanced DSP audio processing, and the AVR-S910W features the Audyssey Bronze suite of powerful DSP features, including MultEQ room acoustic measurement and DSP correction. Via the supplied measuring microphone and mic stand, Audyssey MultEQ measures all the speakers in your home theater during setup, including the subwoofer, and then generates multiple high precision DSP room acoustic correction filters, which together provide smoothest and most natural tonal balance, regardless of the brand or model of the various speakers. Denon's renowned HEOS whole home audio system features advanced multi-room, multi-source audio streaming, and the AVR-S910W features IP control capability with the HEOS Link, so you can control the receiver with the HEOS app. You can configure the AVR-S910W for a 7 channel home theater surround system, or you can choose to have a 5 channel surround system in the main room, with 2 of the amplifier channels dedicated to drive separate stereo speakers in another room. Enjoy a surround sound movie in one room, while others can enjoy stereo sound from a different source in a second room, at the same time. For maximum ease of setup, the AVR-S910W features a horizontal row of premium loudspeaker connection terminals, and the color coded connection system includes a set of color coded speaker cable labels that helps ensure correct speaker cable hookup the very first time. The AVR-S910W's front panel features 4 Quick Select function buttons, so you can quickly choose from the most popular sources, and the system remembers your preferred audio settings for each one. The ergonomic remote control also features dedicated Quick Select buttons for additional ease of use. Rated 5 out of 5 by teetertotter from Fabulous Sound Whether Movies or Music This Denon AVR-S910W does it all for my Movie/Music applications, through my JBL speaker surround system with 2 sub woofers. My AT&T DVR, Sony player, a Pioneer DVR for DVD home movie making/editing from camera, and 50 inch Vizio UHDTV, are all tied into this Magnificent AVR-S910W. I have had this AVR for 6 months, utilizing the initial Odyssey set up with easy to follow instructions. I have tweaked a couple of individual Odyssey sound settings for both movie and music listening. I recently upgraded Denon's firmware through the Wi-Fi feature. I use Logitech's 650 remote. I purchased this unit from our local Best Buy and cannot be more happier with my Dennon AVR-S910W. You will be too! Rated 3 out of 5 by eddiev from Keeps turning on my tv after i turn it off I have the receiver hooked up to a samsung 65" 8-series tv from 2016. It worked great the first year, but starting the second year it started acting funny. I have it on the HDMI control so when i would switch from apple tv to blu-ray, the receiver would change with it automatically. But after a while it stopped doing that. Then more recently, when i turn off the tv the receiver usually turns off and we're all good, but now after the TV powers down, the receiver comes back on and then the TV follows suit. dont know why it's doing that, but i'm sure its not the tv doing that. great sound overall for the receiver, but i had an cheaper onkyo before with no issues. FOr the amount of money spent on this receiver, i was really hoping for it to last a while. Rated 1 out of 5 by Braz de Souza from Grande Som,grandes problemas na placa HDMI Comprei em 2016 um Receiver Denon AVR-S910 W no Mercado Livre do Brasil,com 3 meses de uso a placa HDMI queimou.Entrei em contato com o vendedor e o mesmo nunca respondeu.Desde então,tenho tentado comprar a placa para sanar meu problema,mas...Missão impossível,ninguém tem,onde sabe onde comprar. Receiver parado ha 2 anos. 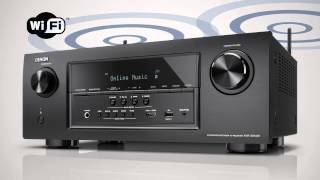 Rated 5 out of 5 by Jb9345 from Everything you want in a great receiver This receiver hits the mark on everything. If you want something to manage your tv audio, apple tv, blueray, play music from your iphone, watch netflix and amazon prime in hi quality sound, look no further. Great receiver! Rated 1 out of 5 by ItalianJohnny from Sounds Great, Shuts off randomly after 369 days This Receiver had everything I wanted. All the Bells and whistles, sounds amazing. But after owning it for 369 Days it will shut off Randomly, quite often, with the Protection led Flashing... I had it in a AV Rack. I moved it out into open air. It still shuts off with the Protection LED. I bought a Small Fan to blow on it, hoping that would help... Nope! During a Movie, it will shut off at least 6 -12 times. Rated 1 out of 5 by My nickname from Distortion after extended high volume levels I really liked the features of this amp especially the internet radio but at louder volumes for extended time it starts distorting so bad you have to turn it down. I expected better quality from Denon. This is my first and last Denon.